I was going to make her incredible Newport-style home-made granola. Her kids’ favorite quick week-night meal, vegetarian chili? All I have for you is a cautionary tale about “seasoning expertly,” in which I attempted an ad hoc pasta dish using butter and fresh thyme…and killed it with half a handful too much sea salt. I don’t even have a photo to show you. But bear with me. Between crazy crazy crazy work and travel and more work and then falling victim to my kids’ terrible flu, I can be forgiven for being just a little more disorganized than usual. I am digging out from under. A real post is in the making. Uh… we went to new HAMPSHIRE, remember? 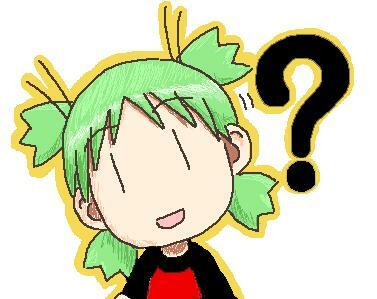 And that cute picture of the green-haired girl with a question mark? I’m pretty sure that’s YOTSUBA from the comics.